Rangoli Chandel Lashes Out At Farhan Akhtar, Karan Johar And Sonam Kapoor For Supporting Hrithik Roshan! Farhan Akthar had made a post in Hrithik Roshan’s favor which has been supported by Karan Johar and Sonam Kapoor. Apparently, Rangoli Chandel is not happy about it! The Hrithik Roshan-Kangana Ranaut controversy has taken a new turn after the former has opened up in a recent TV interview. Many B-town celebs have now come forward supporting the actor in the matter. Stars like Farhan Akhtar and Yami Gautam have talked about the controversy favoring Hrithik. Recently, Farhan had made a post on Facebook which has been supported by Karan Johar and Sonam Kapoor. 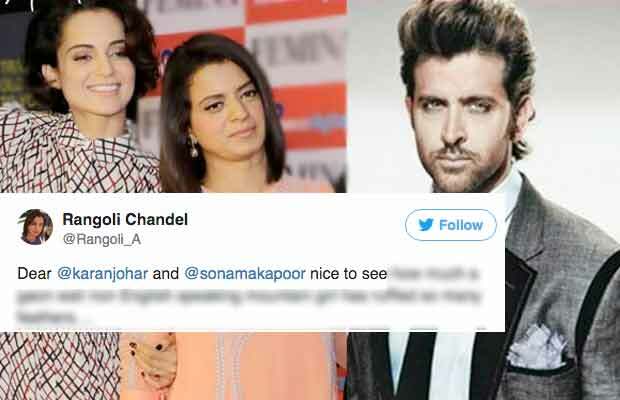 Apparently, Kangana Ranaut’s sister Rangoli Chandel is not happy about it. ….Also why she should bother about private investigations paid by Hrithik Roshan? @FarOutAkhtar pls reply to me. Rangoli was quick enough to reply both of these celebs saying that even after the entire industry being against her, Kangana will still survive because ‘she is the chosen one’. ….Haha even if entire industry stands against her she will still survive because she is the chosen one ?!! Previous articleBigg Boss 11: 4 Padosis Introduced To The Housemates In The Most Unique Way- Watch Video! Next articleBigg Boss 11: After Police Complaint, Zubair Khan Calls Salman Khan Dawood’s Chamcha!